In 1843 Charles Dickens was 31 years old. By then he had already written some of his most famous works of fiction including Oliver Twist, Nicholas Nickleby and The Old Curiosity Shop. His writing had made him famous around the world including the United States. It is a promotional book tour in the United States that director Bharat Nulluri and screenwriter Susan Coyne use as a starting point to tell the story of how Dickens came to write A Christmas Carol. Dickens who is played with an endless abundance of energy by Dan Stevens is introduced at a packed noisy American theatre hall in an over the top opening scene. It sets the tone for the film in which Stevens has almost the same manic charm that Robert Downey Jr embodied Sherlock Holmes with in Guy Ritchie’s films. By the mid-1840s Dickens had a large London home of his own complete with servants and expensive furniture and décor. He and his wife Anna (Morfydd Clark) had four children and another child due in 1844. However, not all of Dickens previous published works including his travel book American Notes for General Circulation had been financial successes. Dickens needed another successful book to ease his own financial difficulties and appease his publishers and that book was the novella A Christmas Carol. In order to have the book in shops by Christmas he had six weeks to formulate a plot and characters and have it written. As his publishers did not back his idea he also had to self-publish it. The trailer for The Man Who Invented Christmas has the tone and style of the many live action films that Disney made throughout the 1970s. Dan Stevens starred as the Beast in this year’s biggest box office success Beauty and the Beast. In this film there are some of that film’s elements of the historical and fantasy combined with the depiction of class that he also ably did in his work in Downton Abbey. The antagonist in this film is writer’s block or the pressure to have a book written by a deadline. Stephen King has often done this in his books and it has translated well to screen. It is interesting to see the craft and pressure of writing applied to Dickens in a commercial feature film. The film suggests that part of the idea for a Christmas ghost story came from myths and stories he overheard his Irish maid Tara (Anna Murphy) reading to his children at their bedtime in his home. A good portion of the film is comprised of Dickens finding inspirational ideas for characters and plot devices around London. As he discovers a new character each of them are depicted on screen as only people he can see and hear. The most famous of course is Ebenezer Scrooge and he is the character who Dicken interacts with the most. 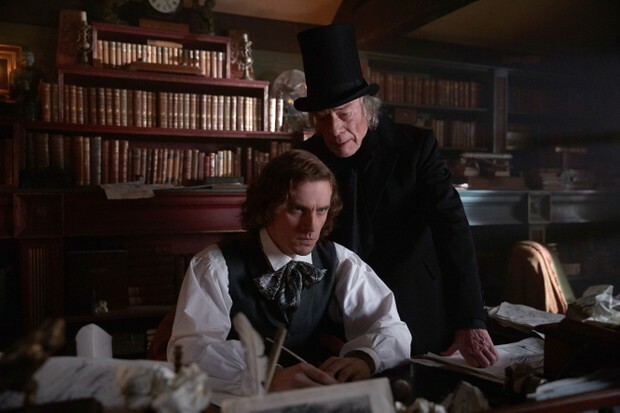 Scrooge is played with beautiful sarcasm and dry wit by Christopher Plummer. The greatest joy of this film is to witness him in this role. Now aged 87 Plummer still has that wonderful look in his eyes that has made him a true cinema legend. Jonathan Pryce plays Dickens father John who is depicted as a sort of lovable rogue but there is also the character’s sadness and poignancy that Pryce skilfully carries throughout the film. Dickens is also depicted in his childhood. These flashbacks are cumbersome at best. A scene in a kitchen is almost straight out of a school play in its presentation. Part of this may come from the fact that the film’s screenwriter Susan Coyne has previously worked in theatre and television. While Stevens, Plummer and Pryce all do fine work the female characters are not as well depicted. Both Morfydd Clark as Kate Dickens and Ger Ryan as Dickens’ mother Elizabeth are primarily depicted as the dutiful wives. Anna Murphy as Tara is given a lot of screen time and also features briefly as another character. Miriam Margolyes is the grumpy housekeeper Mrs. Fisk and like Simon Callow as the book’s illustrator John Leech they are both well cast. The film was partly filmed in Dublin and Wicklow and even with some added CGI it is easy to see which locations were used. There are some scenes where tension is added but they don’t really work as everyone knows that the book does get written and published. The joy in this film is how that journey happens. It is lovely to see a real bookshop like Hatchards in London featured and it connects our world now to way back then. This is a charming film of how the one of the most famous Christmas books of all time came to be.